How can I connect to another screen? To figure out which adapter or cable you need, look at the video ports on your TV, monitor, or projector. Wireless. You can also connect to wireless displays when Windows detects one nearby. 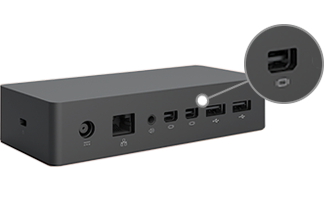 Or, use a Microsoft Wireless Display Adapter to connect to a screen using Miracast. Projector or monitor. 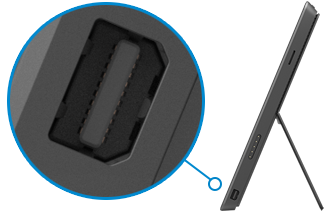 If your monitor has a DisplayPort, you can connect it to your Surface using a DisplayPort to Mini DisplayPort cable (sold separately). If your monitor doesn’t have a DisplayPort or HDMI port, use a VGA cable and the Mini DisplayPort to VGA Adapter. A VGA adapter or cable is for video only. Audio will play from your Surface speakers unless you’ve connected external speakers. For more info about this, see Surface sound, volume, and audio accessories. If you have installed the latest Surface and Windows updates, you can daisy chain multiple monitors from your Surface Pro 2, Surface Pro 3, Surface Pro 4, or Surface Book. Step 1: Connect an HDMI or VGA cable to the HDMI, DisplayPort, or VGA port on your TV, monitor, or projector. 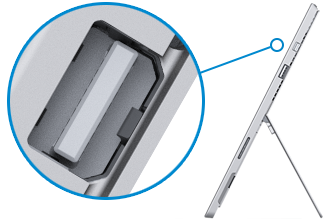 Step 2: Connect the other end of the cable to a Surface video adapter or the Mini DisplayPort on your Surface, or to your docking station. 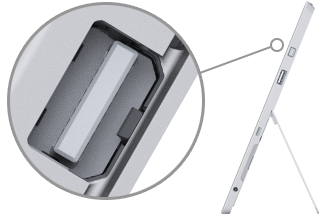 Step 3: If you’re using an adapter, plug it into the Mini DisplayPort on your Surface or your docking station. Step 2: Select Connect, and in the list of displays, select the name of the wireless display. If you have problems connecting your Surface or have questions about screen resolution, see Trouble connecting Surface to a second screen? 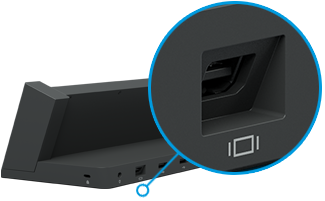 to connect to a screen using Miracast, see Using the Microsoft Wireless Display Adapter with Surface for more info. You can daisy chain monitors using a Surface Pro 2, Surface Pro 3, Surface Pro 4, Surface Book, or a Surface Pro docking station. You’ll need two monitors with DisplayPort 1.2 input ports, and at least one of them must have a DisplayPort output port. You’ll also need standard DisplayPort cables with at least one Mini DisplayPort end to make your connections. 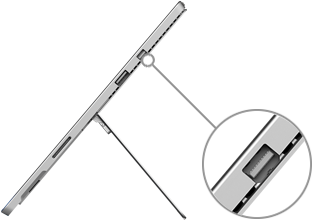 Daisy chaining is not supported on Surface 3 or the Surface 3 Docking Station. 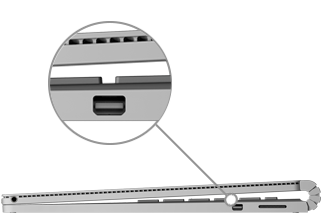 Step 1: Using a Mini DisplayPort to DisplayPort cable, connect the Mini DisplayPort on your Surface to the DisplayPort input on the first monitor. If only one of your monitors has an output port, connect your Surface to that monitor first. Step 2: Connect the output port of the first monitor to the DisplayPort input port of the other monitor. Step 3: Follow the monitor manufacturer’s instructions to set both monitors to use DisplayPort 1.2 as an input source. This might be called Multi-Stream Transport (MST). This is what allows the first monitor to pass the signal along to the second monitor. Step 1: Select the search box in the taskbar, enter project to a second screen, and in the search results, select Project to a second screen. Duplicate: You’ll see the same things on all screens. Extend: You’ll see everything spread over all screens, and you can drag and move items between them. Second screen only: You’ll see everything on the connected screen or screens, and your Surface screen will be blank. To learn how to change the screen resolution, see Trouble connecting Surface to a second screen? +P) to change your options for the additional screen or screens. How many screens can I connect? The number of external screens that your Surface Pro 2, Surface Pro 3, Surface 3, Surface Pro 4, or Surface Book will support depends on your settings for refresh rate and resolution and on whether the display on your Surface is on or off. For Surface Pro 3, Surface Pro 4, and Surface Book, it also depends on which processor you have (i7, i5, i3, or Core M). If you have one or two external displays that you want to run at a higher refresh rate or resolution, you might be able to use them with the Surface display turned off. After you have your second monitor or a projector set up to your liking, you might want to have more than one taskbar to make switching between apps and files easier on the desktop. Here’s how to get taskbars on all of your displays and change how buttons appear on them. Step 1: Select the search box in the taskbar, enter taskbar and navigation, and in the search results, select Taskbar and Navigation. Step 2: Under Multiple displays, select Show taskbar on all displays. All taskbars: The taskbar buttons for all of your open windows will be duplicated on the taskbars on each display. Main taskbar and taskbar where window is open: A taskbar button will appear on your main monitor and in the taskbar on the display where the window is open. Taskbar where window is open: A taskbar button will appear only on the display where the window is open. None of the buttons will be duplicated on other taskbars. Step 4: Select Apply > OK. Connecting another monitor to your Surface is a great way to multitask. You can use one monitor for work (for example, running Office apps) and the other for play (chatting or music). Move Windows Store or desktop apps to another monitor. You can also move a Windows Store or desktop app to another screen by clicking the title bar and dragging it to the other screen. Move Windows Store or desktop apps to the left, center, and right on a monitor. Windows 10 makes it easy to use two apps side by side. For example, you can schedule meetings on your calendar while you respond to email, or record a lecture in class with Sound Recorder while you take notes in the desktop. Step 1: Open an app that you’d like to use. Step 2: Press and hold (or click and hold) the title bar and drag the app to one side of the screen. Step 3: On the other side of the screen, select another app. It will appear next to the first app.